This one thing will change the way you buy or lease used vehicles and will both save, and make, you money. For some, owning just the right vehicle is a point of pride; perhaps even the marker of an item knocked off of a long-held bucket list. For others, it can be a necessary evil; the money spent in order to get to and from the people and places that require our presence each day (yes work, we’re talking about you). Either way, unless you’re a member of the 1%, buying and selling rare vehicle makes and models that actually carry the potential to increase in value, most purchases carry with them the understanding that the vehicle you are about to buy is a depreciating asset – if you can even call it an asset. We go through an inevitable list of things we know to check on in order to ensure that the vehicle is in good shape and will serve its intended purposes. 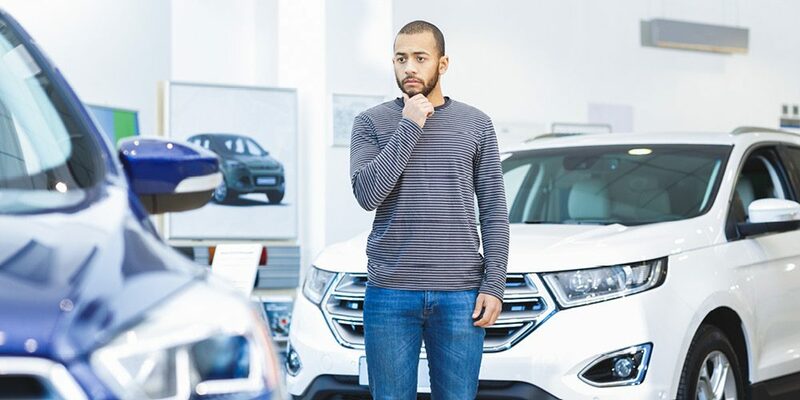 It’s draining, often emotionally and physically, and finding the right vehicle in terms of make, model, mileage and history doesn’t always end up falling in line with the exterior condition you had hoped for as well. Do you buy the one that meets all the criteria but doesn’t look quite like you had hoped, or do you put out the extra $3,000 in order to get the other comparable you found that looks much better aesthetically? It’s a common question that thousands of people wrestle with daily. Everyone wants to love their car, but not everyone has the budget (or desire) to spend that extra 3k in order to make it happen. Keep in mind, that’s not even the end of it! Eventually your needs, budget, or wants will change, and then you need to sell that vehicle and do it all over again. Now it’s time to figure out how to maximize the dollars you can get back for your current vehicle in order to put yourself in the best possible position to get what you want this next time around. Hold on. Don’t stop reading! So as you can see, their issues aren’t that different from yours. You need to find a vehicle that meets your criteria, needs and budget; you want to minimize what you spend to meet that criteria; when you sell you want to sell as quickly as possible; and overall you want to find a quality vehicle that offers the best value for your money. On top of all of this, you want it to look great so that you can be proud to drive it around. Here is the good news: Used-vehicle sales is a multibillion-dollar industry, which means these issues are too important to leave unsolved. The time and resources that the industry has invested in finding a solution have produced a result that can also be yours to take advantage of! For the dealers, it’s not simply good enough to just hope for the best when that kind of revenue is at stake; concrete solutions with proven results are required. 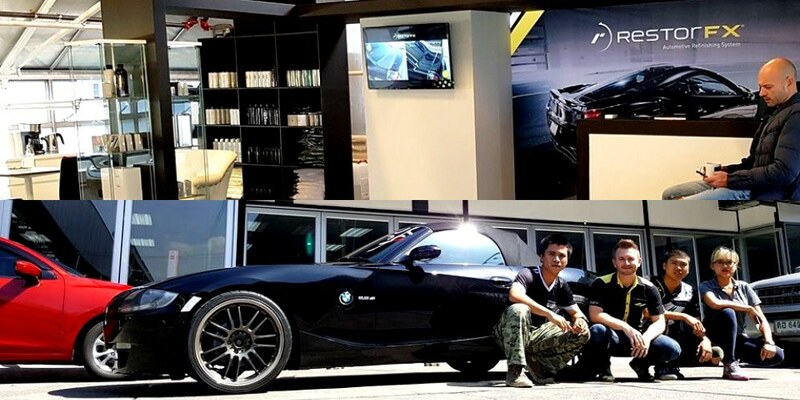 Here is the best part – the same solution that used-car dealers in over 45 countries around the world are using to meet their objectives when it comes to buying and selling vehicles, is also available to the average retail consumer. For over 15 years, more and more dealers globally have been saving money, moving vehicles faster and for more money, while proactively building reputations within their markets for offering used vehicles that look virtually new! The issue has been that the onslaught of wholesale work from these dealers has kept this solution largely a secret from retail consumers… Until now! The dealers’ well-kept secret? RestorFX. Let’s start by recognizing the fact that exterior aesthetics sell vehicles. If there are four different options you are looking at when purchasing a vehicle, all other things being equal (and sometimes even when they’re not), you will buy the vehicle with the best-looking exterior. The one with the best depth of color, the least amount of swirls and scratches, the most impressive shine and the one that hasn’t been repainted since that’s often an indication of previous accidents or body work. This being the case, the best way for used-car dealers to achieve the objectives outlined above is to maximize the number of vehicles that meet general search criteria for their average customer and that also look visually appealing in terms of exterior aesthetics. Remember, though – they also need to do it for the lowest upfront cost in order to ensure they are profitable. That’s where RestorFX comes in. 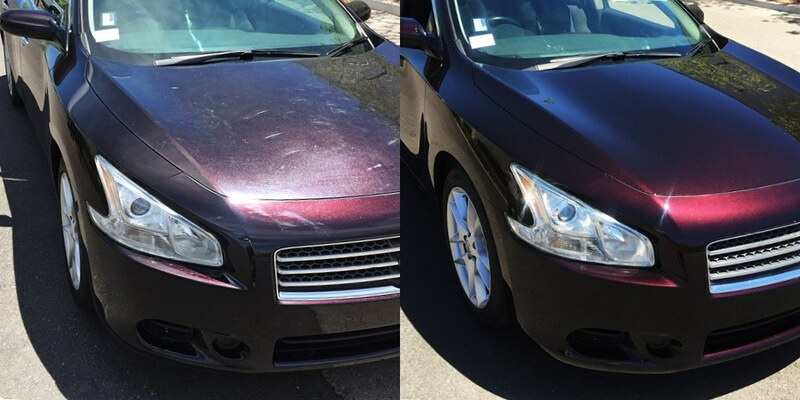 In technical speak, RestorFX is a polymimetic restoration process, which permanently removes scratches, swirls, scuffs, oxidation and weathering in the clear coat of a used vehicle. In layman’s terms, it’s like hitting the RESET button on a vehicle’s finish, restoring it to its original brand-new condition. It’s not to be confused with any of the various coatings on the market, which do nothing to actually address or correct underlying damage in the painted surface. RestorFX works beyond the surface to actually address underlying paint issues, reversing signs of aging and restoring the material’s inherent protective qualities. For better perspective, it helps to get a sense of where RestorFX® technology fits within the industry so that you can really wrap your head around why dealers are so dedicated to this process. For decades, two industries have existed on either end of the automotive restoration spectrum: detailing and the body shop. Detailing exists as a labor-intensive and impermanent option to mask minor damage while producing only temporary results. Its advantage is that it is often cheaper than body shop work. On the opposite end of the spectrum is the body shop (paint shop), which produces permanent results but at the expense of a much longer turnaround time and at a much higher average cost. Also sacrificed is the integrity of the original paint, which, as mentioned, often leads future buyers to believe (whether true or not) that the vehicle incurred some kind of damage in the past. It can also lead to mismatched panels if the entire vehicle isn’t painted. These two industries have progressed slowly with only minor advances to each over the years, with nothing surfacing to occupy the glaringly wide-open gap between them. This space in between is where RestorFX stepped in and pioneered a game-changing niche. RestorFX provides a product and service with a quick, 24-hour turnaround at a cost much closer to detailing services; while at the same time providing a permanent solution that actually fixes the underlying issues just like a paint shop, but without ruining the integrity of the original paint and costing thousands of dollars. While both detailing and the body shop have their place, RestorFX is pioneering a charge within an industry that is becoming widely known and referred to as “smart repair”. This development is an economic solution that requires less time and provides unparalleled results. As a result, dealers are able to purchase vehicles knowing that typical issues within the paint surface can be corrected after they run it through RestorFX before sending it to the front line. They also know it will not only be corrected, but made to look as though the vehicle just left the showroom floor – saving thousands by purchasing vehicles that sell for less due to exterior aesthetics and then spending only hundreds to make it look nearly-new. The best part, you can now buy your personal vehicles this way too! Going for the option that meets all your criteria and needs but for $3,000 less than the option with the great-looking exterior paint; then driving your new purchase over to RestorFX to permanently restore the paint to its factory finish. The same can be done when selling. Just like the dealers, you can have your vehicle ready to sell fast and for more money by simply getting a RestorFX® treatment. With an exterior that looks brand new, your vehicle will stand out from the pack like a sore thumb! Let’s not forget the in-between: it’s not just about buying and selling but also the time that you own your vehicle. Daily wear and tear from washing, weather, road conditions and those tight spaces in the parking lot at the mall (the ones where everyone getting into the car next to yours is rubbing their pants, jackets and keys against your doors) – it can all be permanently erased. No more having to choose between temporary detailing fixes or expensive repaints. RestorFX will get your vehicle back to you in a day so that you can continue to be proud of the way your vehicle looks in spite of life’s little inevitable mishaps. Save money on the purchase, make more on the sale and better enjoy your vehicle while you own it – RestorFX will help you minimize the investment required to own your bucket-list vehicle or simply just get to work in a vehicle you can be proud of without huge depreciation. Ultimately however, all the pictures in the world will never do RestorFX justice. Just like the dealers who rely on the RestorFX experience to sell thousands of vehicles each month around the globe, you need to see it to believe it. If you’re interested in the best of both worlds when it comes to results at half the cost of the typical alternatives, RestorFX may just be for you. For a limited time, RestorFX Centers have agreed to service one panel on your vehicle for free, so that you can experience RestorFX for yourself – no obligation. Just tell your local Center “I’ve learned the dealer’s secret!” and show them this post. Buying, selling and enjoying in-between… Do it all smarter with RestorFX. Adam on Introducing the new RestorFX Website!